One of my friends who don't have a fast Internet connection asked me if I could install El Capitan (which is the highest version of OS X that his iMac supports) and I said sure. 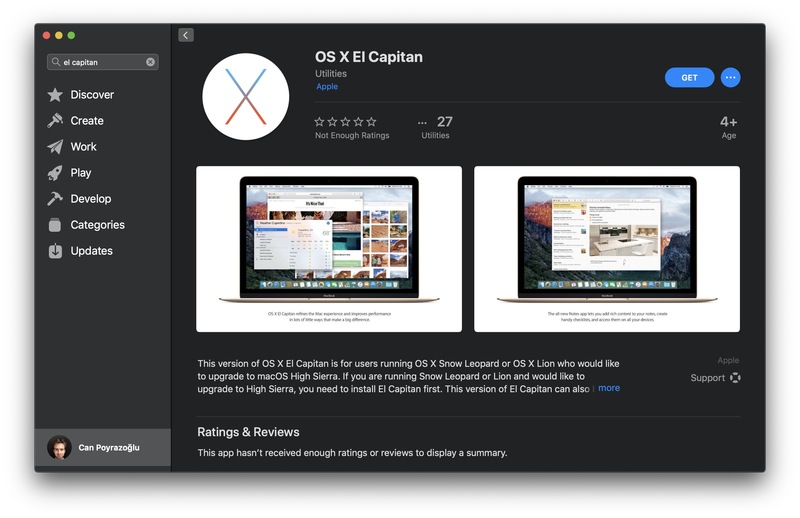 Today I went to App Store to install El Capitan, just for it to download so that I can make a bootable USB for him, and couldn't find it in App Store. Previously, clicking Get button just downloaded an installer into my Applications folder where I could easily create a bootable USB. How can I make bootable El Capitan installer USB in Mojave? Download High Sierra. See How can I download an older version of OS X/macOS? Install High Sierra to a new volume in your APFS container. Here I assume you have enough free space. Goto the Apps store while logged into High Sierra. Download El Capitan. Here I assume you have previously purchased El Capitan. Remove the High Sierra volume from you APFS container. See Remove macOS from a APFS container? Another alternative would be to install High Sierra in a virtual machine. This would avoid the need to remove the High Sierra files from your APFS container volumes. Installing in the virtual machine application does require modifying your current macOS (Mojave). While removing the High Sierra virtual machine would be fairly easy, removing the virtual machine application would probably not be a good idea. So, once you install a virtual machine application, you will probably not what to uninstall. Personally, I have only run Snow Leopard and Yosemite in VirtualBox virtual machines. Other virtual machine applications are VMware Fusion and Parallels. User @user3439894 has posted in a comment a preference for VMware Fusion which was used to run High Sierra. If you choose to use a virtual machine and are having problems setting up, you may want to post a new question. Not the answer you're looking for? Browse other questions tagged el-capitan usb mac-appstore bootable-disk . Can I use the same bootable drive for all models?